The Ashaway Kevlar 17 tennis string features excellent durability in hybrid string combinations. The string offers braided Kevlar that provides superb bite on the ball ensuring superior spin and control. The Kevlar mains are notching resistant. The string is recommended for top amateur and professional players. It features 1.25mm gauge and is 110m (360ft.) long. for submitting product information about Ashaway Kevlar 17 Tennis String - 110m reel We aim to answer all questions within 2-3 days. for submitting product information about Ashaway Kevlar 17 Tennis String - 110m reel. We aim to answer all questions within 2-3 days. If you provided your name and email address, we will email you as soon as the answer is published. 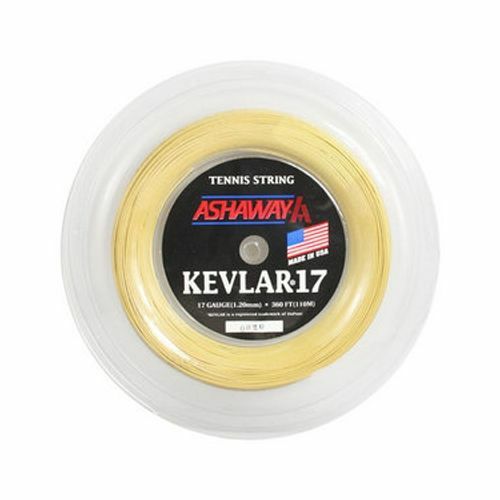 for submitting product review about Ashaway Kevlar 17 Tennis String - 110m reel.